The way we run our business is probably a little unconventional. Simplicity is the name of the game and hopefully our web site will showcase that. The main aim is to offer you the customer the best Artisan cheese around whether browsing our website or visiting our shop. We are an artisan cheese shop based in the small village of Cartmel, just outside of the Lake District national park. We supply the top restaurants in the north-west, including Michelin 2 star L’Enclume which is right on our doorstep. All our cheeses are sourced carefully, we mature all of our cheeses on site using a temperature controlled environment within our shop, taking into account the age and flavour profile of each cheese individually. 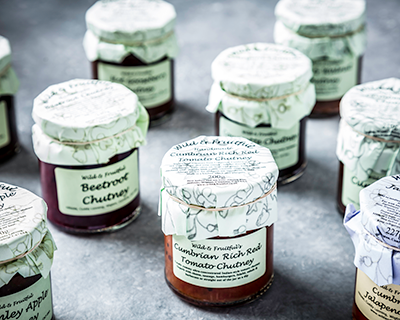 We stock award winning seasonal cheeses, sourced directly from the maker by our in-house cheese experts. 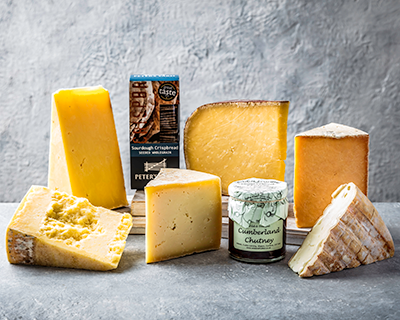 We seek out the very best small-scale artisan cheese producers, tasting every single product we sell in our shop and website. All orders placed via our website are posted in a fully protected, climate controlled box, ensuring that your cheese reaches you in pristine condition. In short, we’re here to help you take your cheese experience to the next level! Feel free to pop in and see us at our shop if you’re in the area. All our parcels are dispatched Monday to Thursday with Parcelforce Express 24. This means you can receive parcels Tuesday to Friday. All parcels at £50.00 and over delivered between those days will be eligible for free delivery. Anything under £50.00 will be charged at £5.95. We also offer a Saturday delivery, but this does incur an extra charge and no free delivery. Any orders to the Scottish Highlands (2 days)/Northern Ireland will also incur extra charges and no free delivery; we also cannot guarantee next day delivery. If you are unsure if we can delivery to your address, please give us a call on 015395 34307. If for any reason you will not be in on you designated delivery date, please leave a note in the comments section at the checkout stating your “safe place”. This means we can make a note on the delivery details for the driver. Please note if we do not receive any notes on your “Safe Place” the delivery driver will not be able to leave your parcel, and we can not be held responsible for the condition of your order on final delivery. We accept delivery for the next working day on all orders placed before 3pm. If you would like to pre order you can do so by selecting the designated date on the calendar. Please be aware if you do not select a delivery date, we will automatically send out the next available day. Any orders received over the weekend without a designated date will automatically be posted out on the Monday. Once we have dispatched your order, you will automatically receive an email including your consignment number. You can then personally track your order through the Parcelforce website. www.parcelforce.com/track-trace. All our parcels are sent out in food grade packaging, in the warmer months we will also include ice packs, to insure your cheese reaches you in perfect condition. Once you receive your parcel please check and refrigerate. Should any problems occur they can be then dealt with straight away. If for any reason you do have a problem either contact us on 015395 34307 or info@cartmelcheeses.co.uk, Please have your order reference to hand. We generally do not accept returns on our cheeses as they are perishable goods. That is why we ask on receiving your order; you check all goods straight away. We will not accept responsibility for any damaged goods after 48 hours. We may ask for you to send us some photos so we can access the damage. If we agree that the goods are damaged or not in perfect condition when you receive them. We will offer you a part or full refund depending on the damage. Any returns will then be taken care of by us. If you are ordering from the Highlands or Northern Ireland we do consider it can take up to 2 days for you to receive your goods, therefore we allow an extra 48 hours for you to check on delivery. Cancellation If you wish to cancel your order, please let us know as soon as possible by phone or by email. Unfortunately, if your order has already been dispatched, we cannot cancel the order. If we receive your cancellation in good time, we will issue you a full refund to the card we debited. Sometimes it may not be possible to send you the exact cheese ordered. Where this occurs, we will replace with an alternative of the same style and quantity. If possible, we will inform you about the replacement before your order is dispatched. All cheeses are cut on the day of dispatch, the cheeses are cut by hand so slight variations in weight may occur. If any of your cut cheese is slightly less than the weight ordered, we will make sure that one of the other cheeses is heavier to compensate. Cartmel Cheeses is committed to ensuring that your privacy is protected. Should we ask you to provide certain information by which you can be identified when using this website, then you can be assured that it will only be used in accordance with this privacy statement. Cartmel Cheeses may change this policy from time to time by updating this page. You should check this page from time to time to ensure that you are happy with any changes. This policy is effective from 25th May 2018. What is the difference between Raw and Pasteurised? Raw describes milk that has not been heat treated in any way, retaining all its natural bacteriological and enzymatic characteristics. Pasteurised a term for milk that has been heat treated usually by heating it to 71.7C (161F) for 15 seconds, to kill natural occurring micro-organisms that may cause disease. Thermised a method of heat treating milk to kill any pathogens in it using temperatures lower than pasteurization. The term applies to Raw milk which has been heated for at least 15 seconds at a temperature between 57C (135F) and 68C (154F). Rennet is a substance used to curdle milk, made from animal, vegetarian, or genetically modified sources. Animal rennet was traditionally the lining of the fourth stomach of a calf or other young dairy animal. The lining was salted and dried to preserve its properties, and cut into strips. Today it is available in liquid or powder form. Vegetarian rennet traditionally used plants such as Lady’s Bedstraw (Galium verum) or the wild cardoon (Cynara cardunculus). Today rennet produced from the fungus mucor miehei or the bactrium bacillus subtilis is generally used. Genetically modified rennet can be used. This is produced in the laboratory by creating the enzyme rennin (also know has chymosin) Genetic engineering techniques create a substance identical to animal rennet without using calf cells. What makes cheese go blue? 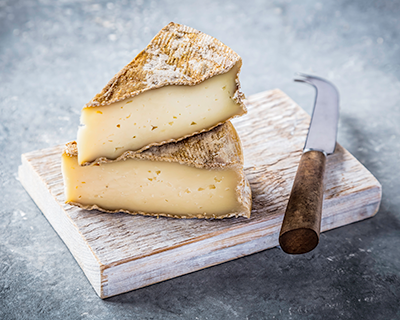 Air can penetrate cheese through the rind, allowing naturally occurring mould spores to form. Penicillium roqueforti is added to the milk and encouraged to grow to intentionally develop the blue-green veins in cheese. What cheese can I eat if pregnant? We can only advise what cheeses to eat during pregnancy; it is the responsibility of the individual whether they chose to take our advice. Hard cheese are safe to eat during pregnancy, they do not contain as much water as soft cheese, so bacteria are less likely to grow in them. Although it is possible for hard cheese to contain Listeria bacteria, they are in such low numbers that they are not to be considered to be a health risk to you or your unborn baby. (Listeria bacteria can cause an infection called Listeriosis). Cheeses that are safe to eat during pregnancy. Hard cheeses are safe to eat during pregnancy, even if they are made with unpasteurised milk. Other types of cheese are also safe to eat during pregnancy, but make sure they are made from pasteurised milk. So long as the cheese coating in question was not made by man alone (like a wax coating) the rind is safe to eat. Depending on your palate, you may find that a little rind complements the cheese and enhances its flavour. You may also find it too strong, bitter, mouldy or textually unpleasant. Whole cheeses are generally happiest in a cool, damp cellar or larder. You may be able to improvise by keeping your cheese in an unheated garage or shed. When stored out of the refrigerator, your cheese will develop more quickly. This can make for more rounded flavours; however, you will need to check it regularly to see how it is behaving. If you are keeping it too warm the cheese will sweat, feel damp, and have a considerably stronger smell. Mould also develops much more quickly on the cut surfaces of cheese that is kept warm. Any unwanted surface mould can easily be cut away with a knife. Small cut pieces of cheese should be kept in the refrigerator to slow the growth of mould on its cut surfaces. However, it is important to be aware that refrigerated cheese is more likely to dry out, particularly if it is not wrapped. The best option is to keep the cheese in a waxed paper within a cardboard box or in the salad drawer (as vegetables create atmospheric humidity). If storing your cheese in the fridge, bring it out a couple of hours before serving, this can vary depending on conditions, so that it can warm through to room temperature. This is very important for the flavour as cold cheese can taste bland and inert. We would recommend eating all cut cheese purchased from us within 14 days, Whole cheeses covered in cloth, follow the instruction leaflet, Wax coated cheeses follow best before date. We would recommend 100g-150g per person. It is possible to freeze cheese. Some hard, or semi – hard cheeses can be frozen without greatly affecting the flavour. Not all cheeses will freeze well, however, especially soft cheeses which can become watery and grainy in texture. Freezing can also affect the texture of some hard cheeses, making it crumbly and harder to use. White Cheese Crystals: Lactic acid and calcium combine to create calcium lactate, which can form in to calcium lactate crystals. Tyrosine crystals form when proteins in the cheese are broken down during the aging process. What is a washed curd cheese? The curd is washed by removing some of the whey and replacing it with hot water, this helps to retain moisture and gives the cheese a delicate sweet flavour and brie-like texture. What is washed rind cheese? A type of cheese made by washing the rind during maturing. This is the final stage in cheese production. The young cheese is aged in an environment that best suits its development. Cheeses that retain a lot of moisture in the curd are matured for less time than those with a dry curd. Soft cheeses require only a short ripening time of a few days before they are ready to eat. Mould ripened cheeses are placed in a warm humid atmosphere to encourage the development of mould on the surface and inside. 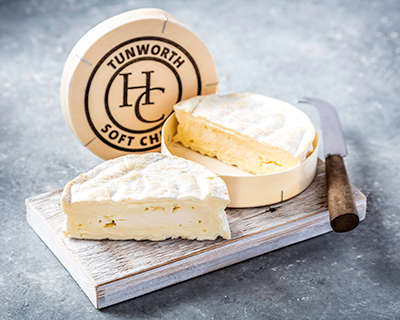 Once the initial shape has been achieved through moulding some cheeses are wrapped in cloth and sealed with butter or lard and matured, this is especially true of large hard cheeses such as Traditional Lancashire’s and Classic Cheddars. This process allows the cheese to develop in flavour and texture and form a rind that will protect the paste. Our job involves working with each cheese, giving it the attention and requirements it needs, so we can offer it for sale to the customer at its best. Cheese will change as it matures. Below are some pointers which will help you to ensure you eat your cheese at its best. Keep it wrapped in waxed paper (maintains humidity/allows it to breathe). Store in a refrigerator, preferably in a cardboard box (prevents it absorbing flavours from other foods), or in your salad compartment (constant humidity). Remove your cheese from the refrigerator and allow it to warm up to room temperature (a couple of hours depending on conditions), before consuming (cold cheese tastes bland and inert). The refrigerator creates a drying atmosphere; we advise you consume any cheese purchased from us within 14 days. 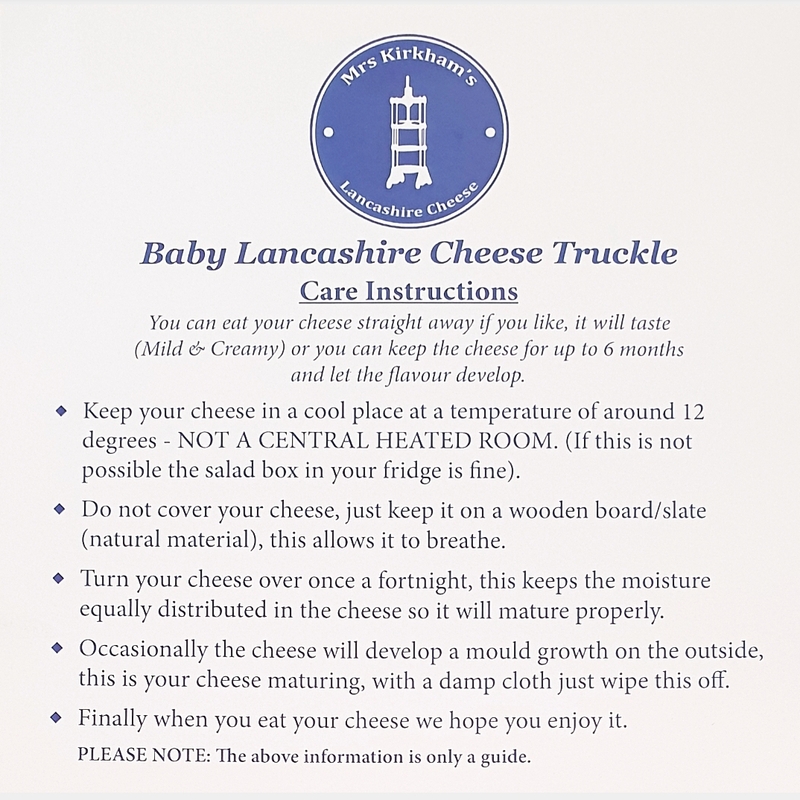 View our Baby Lancashire Cheese Care leaflet here.